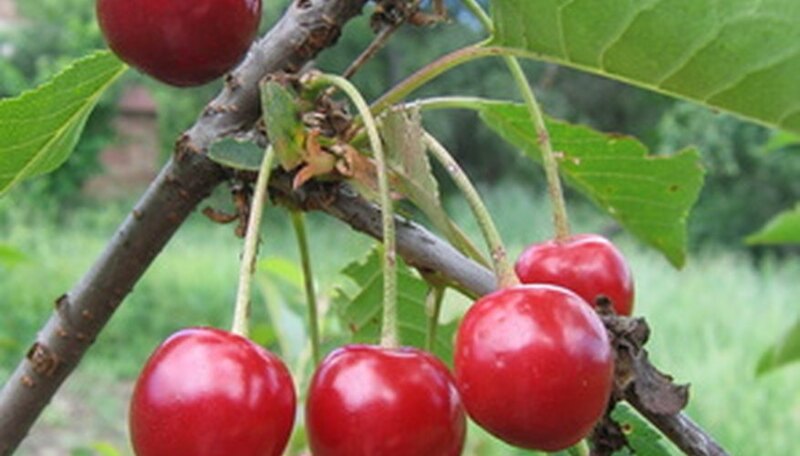 All cherry trees produce ornamental white or pink blossoms in spring, but those that consistently produce quality edible fruits are categorized as either sweet or tart types. Bees facilitate pollination of cherry flowers. Scores of different varieties of cherries exist, many with different cultural requirements, tolerances to cold and soil types, and colors and flavors of their fruits. For best success, consulting local cooperative extension offices or botanical gardens for lists of cherry tree varieties best grown in your area. In the United States, commercial sweet cherry production is most prevalent in California, Washington, Michigan and Oregon, according to the University of California at Davis. Cornell University in New York clarifies that sweet cherries grow successfully elsewhere on the continent where winter lows never drop below -25 degrees Fahrenheit. Sweet cherry fruits range in color from bright red to dark, almost blackened maroon. Other varieties yield white or yellow cherries. Popular red selections include: Bing, Stella, Lambert, Sweetheart, Lapins and Hudson. Dark, nearly black-fruited choices are Angela, Cavalier, Vogue, Black Tartarian, Krisin, Summit and Utah Giant. White-fruit types are Bada, Sweet Ann and Vega. Rainer, Gold and Napolean (Royal Ann); White Gold develop yellow or yellow-with-pink/red fruits. In general, most sweet cherry trees produce more abundant crops when planted in groups to ensure excellent cross-pollination. Choose compatible varieties that bloom at same time. Some self-fertile varieties exist, such as Sweetheart, Lapins, Glacier and Stella. Usually called "sour" or "pie" cherries, the pungent to barely sweet flesh of these varieties is not nearly as popular as the sweet cherries that are eaten raw or enjoyed in juices. Michigan is the leading commercial producing state for tart cherries. Tart cherries demonstrate better cold hardiness and are self-fertile. In cold regions or where mild winters and late frosts occur to kill the very early blossoms of sweet cherries, consider a later-blooming tart type. Gardeners with space for only one cherry tree should grow a tart variety. Common selections include: Early Richmond, Montmorency, North Star, Surefire, English Morello and Kansas Sweet (Hansen). Don't use a tart cherry variety to act as pollinator for a sweet cherry tree type. Cherry trees that produce impressive displays of white or pink flowers that fail to produce large, if any, fruits are enjoyed only for their springtime ornamental value. Many "flowering cherry" species exist, as do hybrids of them. Across early and mid-spring, gardeners gloat about their Higan, Sargent, Yoshino, Okame, Mount Fuji, Snow Goose, Kwanzan or Taiwan flowering cherry. These are but a few decorating their properties. What Fruit Trees Are Good for Indiana? How Fast Do Cherry Trees Grow? What Cherry Trees Can I Plant in Western Washington? Do Cherry Trees Need a Pollinator?